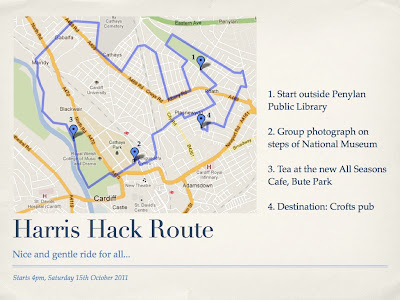 This post is in homage to Dave Warnock who has just achieved the milestone of cycling everyday for one year, and whose regular comparisons of his travel experiences cycling and driving are always a good read. I had a meeting in Swansea last week, for which I had to take the car (issues of meeting clashes and giving lifts to colleagues). On my return, I was able to park in the office car park in the centre of town. I then had to pick up No.1 son from his nursery – barely half a mile away and approximately 7 minutes by bike, whatever the traffic – at the end of the day. I was careful and left a bit of extra time – leaving about 25 minutes for a journey you can walk in about 10. However, I was totally flummoxed by the sheer volume of traffic and so at 10 minutes to six (six is the dreaded cut-off time – otherwise you get fined), I had to ring my partner and beg her to jump on her bike and dash to the nursery as I didn’t think I was going to make it. In the end, she beat me by about 1 minute and I arrived at about 30 seconds to six. She travelled easily twice the distance I had to. I normally arrive to collect my son cheerful, and full of fresh air. This time I arrived completely stressed, panicking and frustrated. I had time (unfortunately) whilst sitting in a solid jam of cars to reflect on the advertising method of promoting cars as tools of freedom, choice and practicality. Those advertising gurus must be geniuses to have conned so many into believing it. Can you imagine my frustration at being 500yds away from my boy, but with no way to get there and no alternative but to sit it out? If I have to take my car again, I’ll chuck the Brompton in the boot and use that at the end of the day – the car can stay in the car park. I’m beginning to resent the gas-guzzling, money draining, time wasting appendage outside. But will we have the guts to get rid of it? To be honest, I doubt it. Until transport thinking catches up with the unarticulated desires of (I believe) many people, and starts considering genuine alternatives, once again that is a choice our addiction to the motor car has denied me rather than enabled - the choice to do without. I was fortunate the other day to be able to visit the Tate Modern in London whilst in the big smoke for a meeting just around the corner. 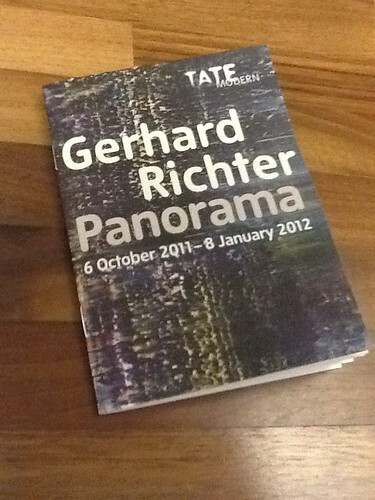 I was particularly keen to visit, following a review I heard on BBC R4 about the exhibition currently showing the work of Gerhard Richter. I was not dissappointed, and neither was I alone - this proved to be a very popular attraction. The paintings are a mix of very abstract and very figurative, but alway showing a quite phenomenal understanding of the nature both of paint as a material in itself, but also of the materials being depicted. The very abstract images were interesting, particularly the random colour squares, which your brain is desperate to interpret as a pixelated image. However, there is no hidden image to comprehend and the sense of disorientation is palpable. I also enjoyed the photographs that have been painted over, blurred and distorted. It is as if they are rushing across the wall, and have just been caught in the exact moment they passed behind the frame - never quite in focus. Their fleeting presence is full of motion and disturbance. It seems as they will be lost again at any moment. There are some hugh images of clouds which you can't quite believe are paintings - the luminosity of the clouds is beautiful and the wispiness of the edges is perfect. But for all the realism, they are scale-less, without romanticism and quite unsettling. Amongst the very abstract "squeegee" images are some smaller, almost photorealistic, paintings that are remarkable in their sense of materiality. One image - "Betty" is of a girl (Richter's daughter) viewed from behind, her face just turned away. She is wearing a fleece-like jumper that so captures the material you can almost feel it between your fingers. People peer closely at the painting, unable to believe it is made just of paint. There is also an image of a burning candle - a traditional study in play of light - where the sensation of glowing hot wax at the tip of the candle is incredible. My personal favourite is the huge canvas of paris, which up close appears to be an abstracted jumble of brush strokes and paint texture. Step away, and the discernable shapes of Hausmann's Avenues begin to appear. Step away further and the buildings appear to be in ruinous, post-blitz state, bombed into broken carcasses. I've heard Richter described as the greatest painter alive. I am in no way qualified to comment on that, but you leave the Tate thinking it is a very believable statement. Gerhard Richter, Panorama. Tate Modern 6th October 2011 - 8th January 2012. Tickets required. 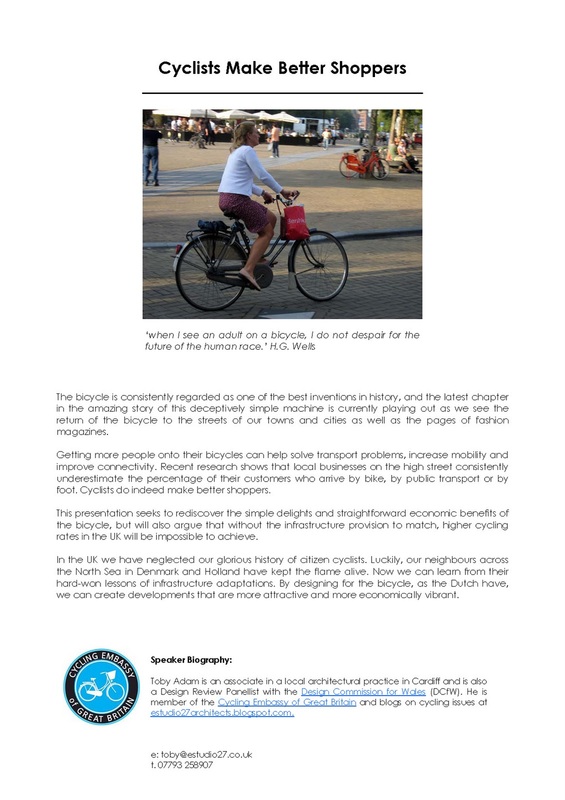 I am hoping to be chosen to speak at a small local conference event in Cardiff, which is an opportunity for transport experts to discuss sustainable transportation and the ways that infrastructure can be used to promote better development. I am hoping to present a paper highlighting the ways that cycle infrastructure could be used to improve the quality of the environment, help create pleasant spaces, improve access to services and connect and create more valuable development, I also want to highlight the economic benefits of encouraging cycling (and cyclists). (b) Why can't these huge lumbering death traps be designed so that they are not quite so deadly for those unlucky enough to be within a few meters of them. Stuff doesn't have to the way it is now. HGV cabs could look different. Roads could look different. We are allowed to change things. 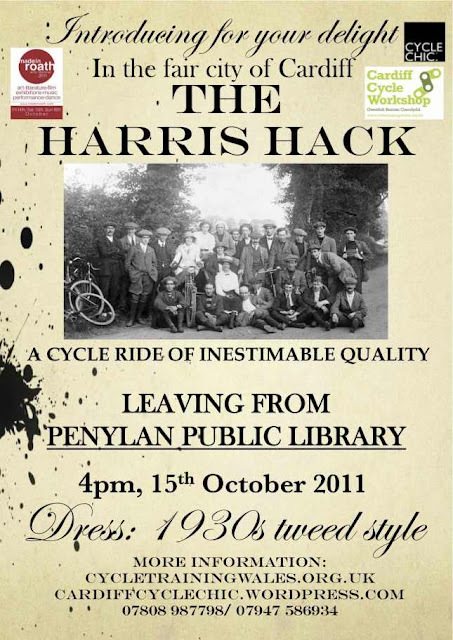 In the 1920's, gut wrenching and visceral campaigns were run by organisations seeking to try and tame the deadly rise of the motor car in cities. Shocking images were used to portray the trail of destruction that the new-fangled motor car was leaving, particularly amongst the young. It very nearly broke the car industry, who survived in part by becoming heavily involved in safety campaigning themselves and changing the focus by blaming instead the children who were playing in the streets. The ancestors of this paradigm are posters like the one above. However, things are different today and an all-out assault on the government focusing on the unimaginable horror of being crushed by an lorry might prove more fruitful. How tragic that even thinking that way should be required at all. This is concrete (chocolate) proof that inflation has gone through the roof. This is chocolate money, which I'm pretty sure only came in coin form when I were a lad. 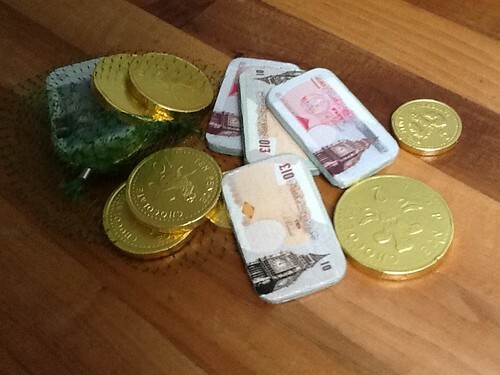 Imagine my apoplectic rage on discovering that chocolate money now includes notes as well as coins! Up to £50 ones for goodness sake! No doubt next time I buy some, I'll end up carrying it home in a wheelbarrow. Whatever next. There is always a lot of discussion in architectural circles about the "privatisation of public space". I shall illustrate what this frighteningly architectural phrase means, by referring to the example of shopping centres. 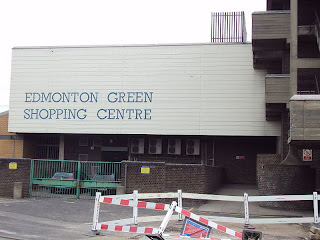 Once upon a time, a shopping centre was an easy concept to understand - a place where shops were collected together indoors, and they were equally easy to spot - they often helpfully had the name "shopping centre" stencilled on the outside. It was easy to see where they started and where they finished (doors to enter and leave) and it would therefore be reasonable to assume that they were indeed private space. Even if the mall formed an important connection or route within a city, it would be normal to assume it would close at 5.30pm, and reopen at 9.00am. You would not have been surprised to know it was owned by private enterprise, and not the public in the form of the Local Council. 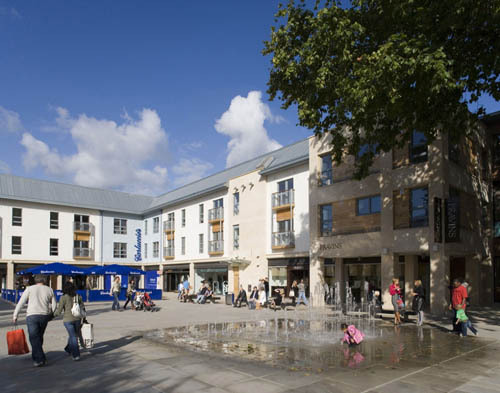 But shopping centre design moves on. Even the name moves on - they are now malls, or arcades. 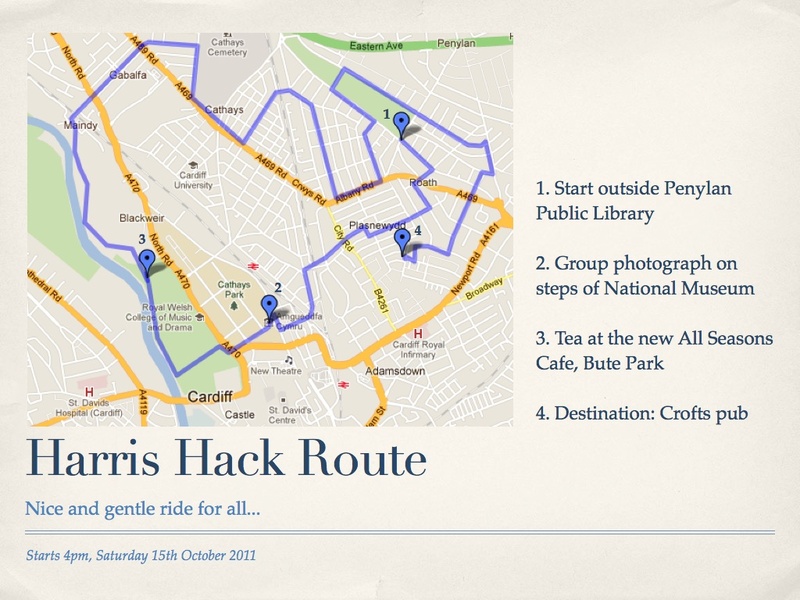 In Cardiff, the people of the capital city are the proud recipients of St David's 2 (the sequel), which has the traditional spine route, covered, on two levels. There are doors to enter and leave and there is an anchor store at the end - John Lewis; thus propelling Cardiff into the big time. All very familiar thus far, but also all very obsolete. Because SD2, as we are encouraged to call it, might be the last hurrah of this now familiar typology. In Liverpool and Bristol, amongst others, new kinds of shopping centre have been developed and they look a lot like any old part of the town. In fact, they look a lot different to what we have become accustomed to believe a shopping centre should look like. These new kid on the block have streets, townscape and urban scale. They are open to the elements. They might even have roads with traffic, but they certainly do not have doors to enter and leave. You would be forgiven for thinking that they are simply bits of the city that host them, although with less litter. However, they are not. They are private space. They are controlled by private enterprise, and if you start taking photos, polite well dressed gentlemen with radio earpieces and clip-on ties will appear and ask you to leave. These bits of city are therefore certainly not bits of city in the traditional sense. So the urbanists and theorists get excited about sanitisation of space, the loss of the right to protest, rights of access, rights of assembly, the impact of private ownership within public space etc etc. But in truth, the ubanists have missed the boat. This privatisation of public space has been going on for years under our very noses with very little complaint. Large chunks of precious public realm have been enclosed and fenced off, with the process starting nearly 100 years ago. The space demarcated for motoring, a particularly private pursuit, has been expanding ever since. The amount of land dedicated to the private motor car in urban centres, for both its movement and storage, is surely staggering. One only needs to consider the rents that could be achieved on the square footage occupied at present for free. The effect of this "enclosure" is quite debilitating to a sense of community and civility. What is required is an about-turn in how we think about the use of space in cities. It is simple and obvious; the self propelled citizens should be in the role of the occupiers whereas the motor-powered citizens must be the guests. This is where the role of the bicycle is critical as a tool of radical thinking. You see, by making the effort to make cycling easy, for instance by providing quality segregated infrastructure, a city would thus overtly state its position that non-motorised citizens (pedestrians and cyclists) are welcomed by right, whereas the motorised are tolerated by necessity. By building segregated cycling infrastructure and all the necessary compromises to the hegemony of cars that go with that, a city will be reclaiming space for all its citizens, for Civitas.